FC Barcelona joined the rest of the world on Thursday in celebrating International Women’s Day 2018, in order to bring attention to the indispensable role of women in everything the Club does, both on and off the field. Among the highlights of the Club’s observance of International Women’s Day was a conference hosted in the 1899 Auditorium, entitled ‘It’s football, and it’s for women.’ The main purpose of the conference was to reaffirm the Club’s support for women’s football. The Club gave professional status to the Women's first team in the summer of 2015. 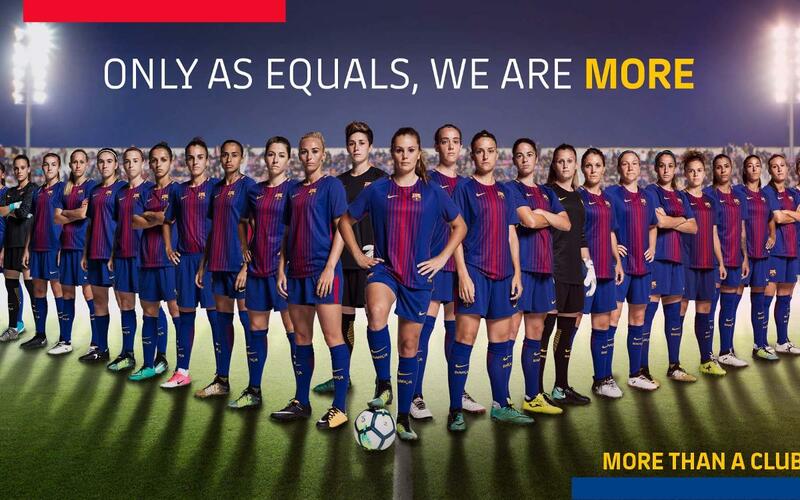 On FC Barcelona’s social media accounts, such as on Facebook and Twitter, the above image of the Women’s Football team and the ‘Only as equals, we are more’ slogan was uploaded as the main profile picture. But across the Club’s official digital channels, observance of International Women’s Day 2018 went far beyond the 25 women on the first team. FC Barcelona currently has 65 other female athletes playing football on its various youth teams, bringing total female participation to 90. Besides the Club’s athletes and employees, one of the most renowned characteristics of FC Barcelona is its enormous membership base. Of the Club’s more than 143,000 total members, over 38,000 are female, which is approximately 26%. FC Barcelona has an even bigger base of supporters club members, which number more than 152,000, some 28% of which (43,000+) are female. FC Barcelona, through its Foundation, works daily to promote programs aimed at bolstering social inclusion and gender equality. In recent years, the Foundation's FutbolNet methodology, which aims to instill in children the values inherent in sports, has gotten good results in the most disadvantaged communities and environments.